QUITO, ECUADOR – The Ecuadorian military hosted a team of Soldiers from the Kentucky National Guard recently during a military-to-military event through the State Partnership Program. The event focused on vehicle maintenance procedures, involved Guardsman visiting maintenance shops at an Army base in the capital, Quito, and also a Marine base in Guayaquil, June 3-9. The Kentucky National Guard has been partnered with Ecuador since 1996, and has collaborated in more than 70 missions in both countries. The partnership is enhanced by conducting exchanges focusing on military and civilian best practices in areas which include: air and land forces interoperability, disaster management, professional development, engineering, aviation, medical support and communications. With the SPP, the Ecuadorian military has the ability to purchase U.S. products through a Letter of Request. 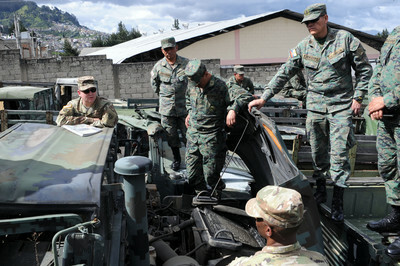 “This visit means to revive cooperative relations between the military institutions of both countries regarding the aspects of doctrine, techniques, in the determination of needs and processes of obtaining the necessary spare parts and also the execution of the maintenance plan for the HMMWV vehicles,” said Lt. Col. Milton Sanchez, Ecuadorian Army Maintenance Battalion commander. The Kentucky Guard maintenance team conducted training on preventative maintenance, plans, and shop procedures with the mechanics and leadership of the Logistics Command “Reino de Quito” Number 25. According to Maj. Jamie Carta, State Partnership Program Coordinator, cooperative training exercises such as this, and key leadership engagements help our Service Members learn from each other and build lasting relationships that will continue to build our forces for the future. “This visit was very productive because it allowed both our militaries to come together and determine a proper form of executing the maintenance and operability of our vehicles,” said Sanchez. The Guardsmen left confident in meeting the intent of their leadership to assess the Ecuadorian vehicle fleet and supply systems. “Moving forward we hope to further strengthen the partnership with training opportunities in Ecuador and in Kentucky,” he said.